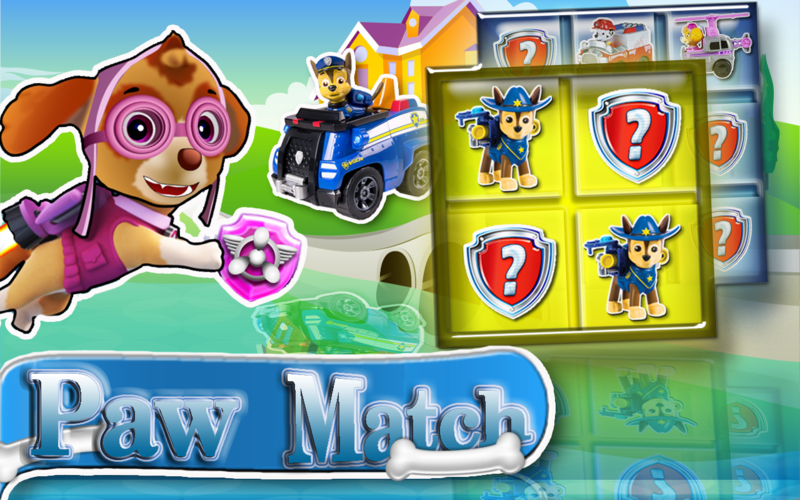 Are you ready to challenge your memory dailywith the free "Memory Paw Match Patrol" ? A great game to exercise your brain! Wonderful for kids too, sinceit has cute animals pictures to match. If you have a child trainhis memory with our puzzle. If you noticed that sometimes you forget things then "Memory PawMatch Patrol" is the best for challenging and training yourmemory. This trivia game is for fun and knowledge. Brain trainer . Pairs game. Brain & Puzzle game - best from memory kids apps. Jigsaw FNAF Puzzle Toys is one of the mostpopular logical reasoning games in the world. The secret is itsattentiveness challenge. Trying to find a matching piece youimprove your visual memory and search skills. Our new puzzle gamesfree will give you some wonderful time of matching beautifulpictures on your device!Jigsaw FNAF Puzzle Toys works almost like real jigsaw puzzles forkids. Once you pick a piece it stays on the board even if you placeit incorrectly, and you can nudge pieces around until it snaps tothe right slot.Each relaxing puzzle features a different beautiful scene drawn bya professional Five Nights At Freddy's artist, and a unique rewardwhen the jigsaw puzzle is completed.If you like to solve puzzles, you'll appreciate this logic gamemost of all! Choose the level of difficulty which is the mostsuitable for you and start your adventure! Jigsaw Mickey Puzzle Toys is one of the mostpopular logical reasoning games in the world. The secret is itsattentiveness challenge. Trying to find a matching piece youimprove your visual memory and search skills. Our new puzzle gamesfree will give you some wonderful time of matching beautifulpictures on your device!Jigsaw Mickey Puzzle Toys works almost like real jigsaw puzzles forkids. Once you pick a piece it stays on the board even if you placeit incorrectly, and you can nudge pieces around until it snaps tothe right slot.Each relaxing puzzle features a different beautiful scene drawn bya professional The Mickey Mouse artist, and a unique reward whenthe jigsaw puzzle is completed.If you like to solve puzzles, you'll appreciate this logic gamemost of all! Choose the level of difficulty which is the mostsuitable for you and start your adventure! In This mission you will join on the Painting& coloring Books Kids Coloring FNAF Academy for kids.This coloring games has many sketch of favourite animatedcharacters for kid to paint color.A new feature in this game is that kids can toggle between brushmode and fill-bucket mode to begin coloringThe Best Kids Coloring FNAF book of kids game! Color the coloringpages of Five Nights At Freddy's.On your phone or tablet. In this princess game, girls can not onlycolor the coloring pages, but also get random colorings to startfrom.What colors to use to complete the, level. The coloring book allows,children to enjoy the colors and ,painting. Help your kids toimprove their creativity...Just make full use of your fancy imagination and have fun!Choose a color button then click the part of the picture you wouldlike to make that color.The user interface was designed especially for kids, therefore youdon't need to worry about confusing buttons or menus.Features:* Share with your friends;* Save to SD card;* Gradient coloring* Magic coloringEnjoy the game! Jigsaw Thomas Puzzle Toys is one of themostpopular logical reasoning games in the world. The secret isitsattentiveness challenge. Trying to find a matching pieceyouimprove your visual memory and search skills. Our new puzzlegamesfree will give you some wonderful time of matchingbeautifulpictures on your device!Jigsaw Thomas Puzzle Toys works almost like real jigsaw puzzlesforkids. Once you pick a piece it stays on the board even if youplaceit incorrectly, and you can nudge pieces around until it snapstothe right slot.Each relaxing puzzle features a different beautiful scene drawn byaprofessional Thomas And Friends artist, and a unique reward whenthejigsaw puzzle is completed.If you like to solve puzzles, you'll appreciate this logic gamemostof all! Choose the level of difficulty which is the mostsuitablefor you and start your adventure! In This mission you will join on the Painting& coloring Books Kids Coloring mickey Academy for kids.This coloring games has many sketch of favourite animatedcharacters for kid to paint color.A new feature in this game is that kids can toggle between brushmode and fill-bucket mode to begin coloringThe Best Kids Coloring mickey book of kids game! Color the coloringpages of Mickey Mouse.On your phone or tablet. In this princess game, girls can not onlycolor the coloring pages, but also get random colorings to startfrom.What colors to use to complete the, level. The coloring book allows,children to enjoy the colors and ,painting. Help your kids toimprove their creativity...Just make full use of your fancy imagination and have fun!Choose a color button then click the part of the picture you wouldlike to make that color.The user interface was designed especially for kids, therefore youdon't need to worry about confusing buttons or menus.Features:* Share with your friends;* Save to SD card;* Gradient coloring* Magic coloringEnjoy the game! Are you ready to challenge your memorydailywith the free "Match PJ Memory Masks" ?A great game to exercise your brain! Wonderful for kids too,sinceit has cute animals pictures to match. If you have a childtrainhis memory with our puzzle.If you noticed that sometimes you forget things then "MatchPJMemory Masks" is the best for challenging and trainingyourmemory.GAME FEATURES- Match pairs of pj masks- Different levels of difficulty- Colorful images of pj kids mask to be easily rememberedThis trivia game is for fun and knowledge.A free memory game for kids and adults .Brain trainer . Pairs game.Brain & Puzzle game - best from memory kids apps. In This mission you will join on thePainting& coloring Books Kids Steven Coloring Academy forkids.This coloring games has many sketch of favourite animatedcharactersfor kid to paint color.A new feature in this game is that kids can toggle betweenbrushmode and fill-bucket mode to begin coloringThe Best Steven Coloring book of kids game! Color the coloringpagesof Steven Universe .On your phone or tablet. In this princess game, girls can notonlycolor the coloring pages, but also get random colorings tostartfrom.What colors to use to complete the, level. The coloring bookallows,children to enjoy the colors and ,painting. Help your kidstoimprove their creativity...Just make full use of your fancy imagination and have fun!Choose a color button then click the part of the picture youwouldlike to make that color.The user interface was designed especially for kids, thereforeyoudon't need to worry about confusing buttons or menus.Features:* Share with your friends;* Save to SD card;* Gradient coloring* Magic coloringEnjoy the game! Jigsaw Sponge Puzzle Toys is one of the mostpopular logical reasoning games in the world. The secret is itsattentiveness challenge. Trying to find a matching piece youimprove your visual memory and search skills. Our new puzzle gamesfree will give you some wonderful time of matching beautifulpictures on your device!Jigsaw Sponge Puzzle Toys works almost like real jigsaw puzzles forkids. Once you pick a piece it stays on the board even if you placeit incorrectly, and you can nudge pieces around until it snaps tothe right slot.Each relaxing puzzle features a different beautiful scene drawn bya professional Spongebob Squarepants artist, and a unique rewardwhen the jigsaw puzzle is completed.If you like to solve puzzles, you'll appreciate this logic gamemost of all! Choose the level of difficulty which is the mostsuitable for you and start your adventure!